Manic Coffee | Mmm, Tasty! Back in February when I posted the Toronto Coffeeshop Roundup, a reader named Mia commented to let us know about a great place down on College Street called Manic Coffee. Ever since then we wanted to go check it out, but didn’t have a chance to until about a month ago. The first thing I noted with all the online reviews of the place was that people were complaining about the lack of free or paid wifi. This is a strictly wifi-free place. Once you’ve been there, you can see why the owner made that decision: the place isn’t really suited to people sitting long hours with their laptops. It has a different vibe than that, more relaxed and easy, more the place to hang out with friends over a cup of coffee than to study or work at your computer. The coffee menu contains all your coffee favourites: cappuccinos, lattes, americanos, drip coffee, and more. You can also get hot chocolate or tea, if coffee is not your thing. But the best thing about this place is over on a separate menu, back against the wall: coffees available for the clover machine. If you’ve never had coffee from a clover, you can really taste the difference. I was a bit skeptical at first, but one sip and I was hooked. Rich even really likes it, and ends up drinking it black or with just a bit of sugar; he takes most coffee with milk and sugar. I’ve since tried all three coffees they have available and love all three, although I am partial to the Ethopian. 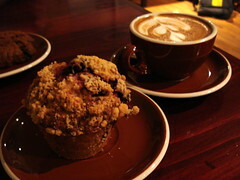 Also of note about their coffees is the fact that they come from Intelligentsia. The beans are directly purchased from farmers at the source, and are roasted at the company’s headquarters. As for food, everything they sell comes from another Toronto business, Wanda’s Pie in the Sky. Almost everything is vegan, but don’t let that scare you away: vegan does not mean boring and healthy! So far we’ve tried several types of cookies including chocolate chip, oatmeal, and double chocolate, two different scones, and one of their berry burst muffins. We loved every single one. My only (minor) complaint about the food is that they don’t really carry any lunch foods like sandwiches or salads. However, given that they don’t seem to be going for that market, I can’t say I blame them. This is a stop in for a coffee with a book kind of place, not stop in for lunch on your break kind of place. And I like it that way. I think we’ve found our new favourite cafe. 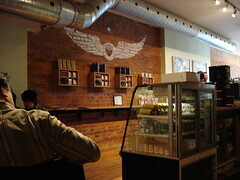 Manic Coffee: 426 College Street, Toronto, (416) 966-3888.